This is yet another thing that’s come together because of wild ideas over beers. Specifically, beers shared with Joel and Toby of The Mountain Men who came over from Sydney to make crazy-beautiful music with the Kankanai Tribe. I’d share the entire story, only my hands are too achy from drawing and inking the poster to type any more. Just come by the gig on Thursday and we’ll tell you all about it. Or read the project description below for the er, “official”, take on it. Or mosey on over to the Common Threads event page on Facebook. What do you get when you take a handful of disparate elements and strip out everything but what is truly essential? You end up with Common Threads. Common Threads is about weaving visions out of broken barriers, fresh perspectives and unconventional parallels. It creates a string of connections and follows them until we reveal the full tapestry of humanity. 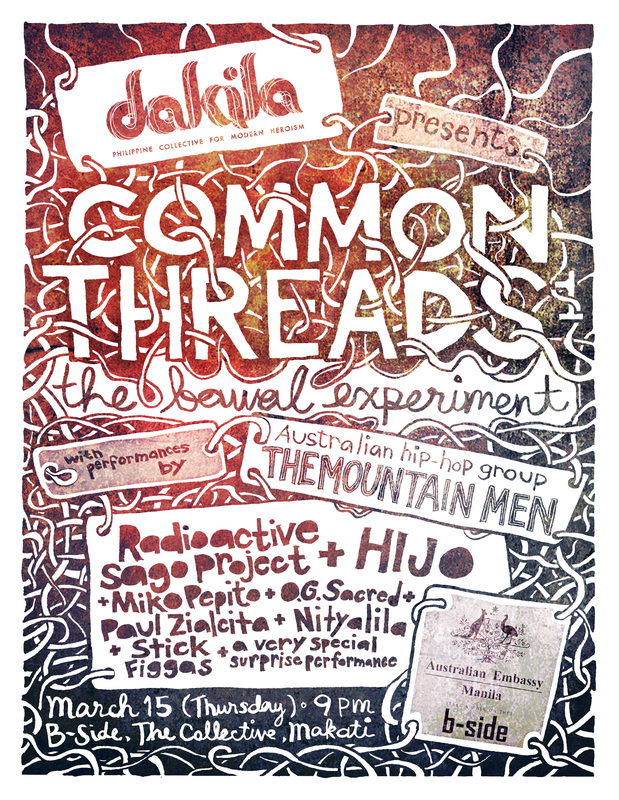 Dakila – Philippine Collective for Modern Heroism presents Common Threads as a platform. We’re taking creative people from different parts of the world and throwing them together with one task: To get along well enough to produce something that blows our minds with expressions of truths that tie us all as human beings. This is an example of what people usually call collaborations. We’re calling them experiments. We’re into chucking stuff together to see if they either go “Boom!” or uncover the meaning of life. If we’re lucky, maybe we’ll end up with a little bit of both. A few of our pioneering mad lab rats are The Mountain Men, an Australian hip-hop duo that defies definition; Francis de Veyra, a music maven best known for his award-winning movie scores and genre-transcending band, Radioactive Sago Project; OG Sacred, the Tondo-born rap innovator whose eloquent poetry belies his working-class gangster roots; and Miko Pepito, a spoken-word artist and music producer who’s best described as a disco-dancing warrior-poet. They’ll be diving into Common Threads #1: The Bawal Experiment, a musical exploration of the taboos in their different cultures and how art can knock down those restrictions. Joining the fray are a motley crew of artists sharing their musical and visual interpretations on the concept of Bawal (and Not Bawal). The Bawal Experiment features performances from the Radioactive Sago Project, Paul Zialcita, Nityalila, Hijo, Stick Figgas, OG Sacred, Miko Pepito and The Mountain Men. Find out if we can pull it all off at the Common Threads launch on March 15 (Thursday), 8pm at B-Side, The Collective in Makati. this poster design is a goodone. it have a special effect in the eyes of the one who sees them. the use of fonts is just great. thanks for sharing this poster. Enter your email address to follow All Kinds of AWESOME and receive notifications of new posts by email.